Litter dumped in the scenic Koslanda area is threatening a fragile ecology already affected by forest fires and water pollution. A huge spread of rotting rubbish, cardboard boxes, soft drink cans, plastic bottles, polythene bags, beer bottles and plastic bags contribute to the stench. The decomposing trash goes into streams, the main source of water for thousands of families and is now destroying the area’s delicate flora. 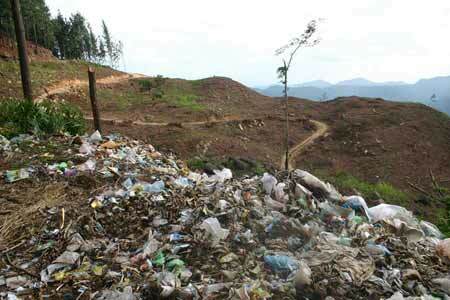 The dump will cause further pollution as the monsoon sets in. 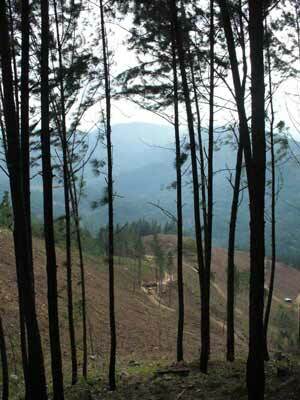 These pictures are of a Forest Department pine plantation in a watershed that was demarcated in 2003 by the Government as Sri Lanka’s first Sustainable Development Zone. The Koslanda SDZ was announced at the Tokyo Donor Conference as part of the Regaining Sri Lanka Tourism Initiative. An Inter-Ministerial Committee on Sustainable Development led by the former Presidential Secretary K.H.J.Wijayadasa met for almost two years to design this model of sustainability in the upper watershed of the Kuda and Kirinde Oyas that supplies water downstream. The Koslanda SDZ attracted direct foreign investment to the region based on a green ethic of environmental laws and ideals being practised and implemented by the Government. The Diyaluma Falls is also located in this watershed. One fact that emerges from the photographs is that the people of Koslanda town have been dumping their garbage for sometime in the Forest Department plantation with no protest from the Dept. Once the trees were cut the dump was exposed. The second is that the Timber Corporation doesn’t seem to be doing any erosion control on these steep hillsides. A simple strip of trees along the contour would have helped. “The President has stated in New York that largely as a result of human activity, our precious environment is becoming unstable and increasingly hostile. “If officials do not match the President’s words with action on the ground the next war will be over water,” says Manik Sandrasagra, a resident of the proposed Zone.